OK, so you paid $50k plus for a car and opted to pony up another $700 for the Xenon option. You love the xenon's but the first time you saw your car with both the lights and fogs on you thought you might cough up your supper. 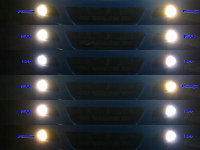 The factory bulbs (Phillips) put off the typical yellow hued light associated with standard automotive applications. They stand out like a sore, ugly, yellow thumb in comparison to the cool white light of the xenon's. What to do? Most of the people that I've had a chance to chat about this with seem to have chosen one of the following: PIAA 9006 Xtreme White Plus (Professional Halogen Lamp Systems) and SPP 9006 55W Super White (Supreme Power Parts). Both are an improvement over the Phillips OEM bulbs and both are not perfect. PIAA bulbs are far more expensive than SSP ($80 vs. $30) and are available through a variety of on line sources. 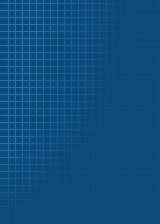 SPP bulbs are only available from SupremePowerParts.com. 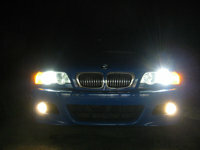 Matching Xenon lights with non Xenon bulbs is generally just about impossible. Getting close is the name of the game (assuming this is your goal). In this game the SPP bulb comes much closer than PIAA. The SPP bulbs have a bit of a blue tint (a little more so than Xenon main lights). The PIAA bulbs are more to the yellow end of the spectrum though not nearly as yellow as the OEM bulbs. The SPP blue tint is not really in the realm of rice and generally if someone is not looking very closely at the lights it's pretty hard to see at all. PIAA's yellow tint stands out much more than the blue tint from SPP. You can tell quite quickly that the bulbs do not match the main lights. 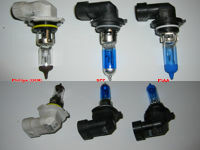 Both manufacturers' bulbs fit fine (though PIAA's require a bit of cajoling to set into the plugs). Installing the bulbs is about a 10 minute affair either way. SPP bulbs come with 1 year warranty from the manufacturer. 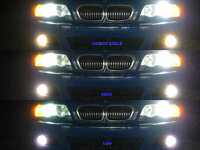 It's actually a lot easier to show the difference in the bulbs that to explain it and thus the pictures in this review. I feel that the images do justice to the actual colors in real life.